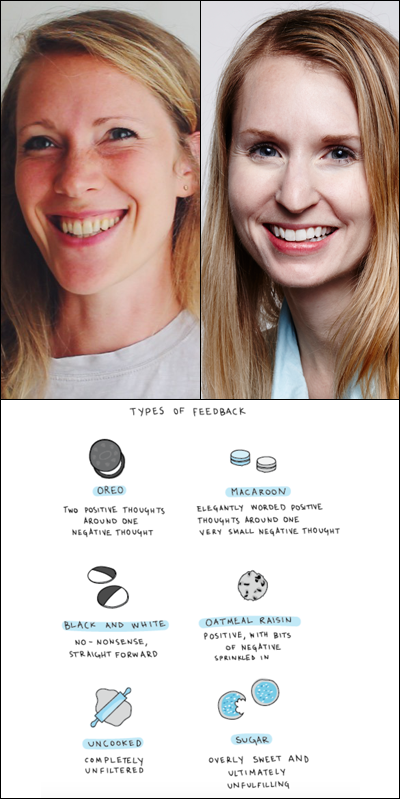 Our side project is an illustrated book (working title: No Hard Feelings) that aims to make it OK to acknowledge emotion at work. The problem with the idea that emotion does not exist at work is that humans experience emotion constantly, independent of time, location or task. Of course, there are large differences in how individuals react to emotion, but emotion itself cannot be turned off. More importantly, emotions can serve as valuable guideposts for decision-making. We should not want to turn our emotions off. Our goal is take an affectionate but deeply researched look at how emotions profoundly affect key aspects of our professional lives and gives readers a framework for better understanding and embracing emotions at work. Each chapter focuses on how emotions impact a different part of work: from teams to health to communication to motivation. Every chapter includes a combination of business case studies, personal narratives, research studies and illustrations, and shows readers how to become more effective by improving their workplace emotional fluency. At its core, No Hard Feelings argues that if employers and employees can become comfortable communicating emotions and acknowledging the emotions of others, we can all be more authentic, productive and fulfilled in the workplace. Mollie: I get up around 6 or 6:30 most mornings to write, and then work on the weekends. It takes a lot of discipline, but it’s fun work, so I enjoy making time for it. We both find it to be incredibly rewarding and fun. It engages a different set of muscles than we use in our other jobs. It’s also something that is uniquely ours—we aren’t doing it for anyone else. We are writing the book that we want to read! A side project also acts as job therapy. When work is frustrating or hard or simply dreary (which even the best jobs are at times), burrowing yourself in your side project is a lovely outlet and escape. It's a BEAUTIFUL and cathartic thing to want and work on something for yourself that originates from you. Diptych courtesy of Liz Fosslien and Mollie West Duffy.